The City of Cape Town has a holistic approach to implementing energy efficiency in its buildings. They have embarked on a journey where they have ensured the implementation of smart meters and developed a data monitoring system coupled with energy efficiency interventions. Training of key employees was critical in ensuring the sustainability of the programme. The City put out a request for proposal to train its facility managers on the fundamentals of energy management but required that the service provider include a practical component in the training to ensure that the theory and concepts taught are understood and grasped by its employees. The City developed a training guide on how to access the smart meter data and asked that the service provider incorporate this training material into their programme. The Energy Training Foundation was the successful bidder and was awarded the contract. Together the Energy Training Foundation and the City developed a unique programme custom designed to meet the City’s needs. 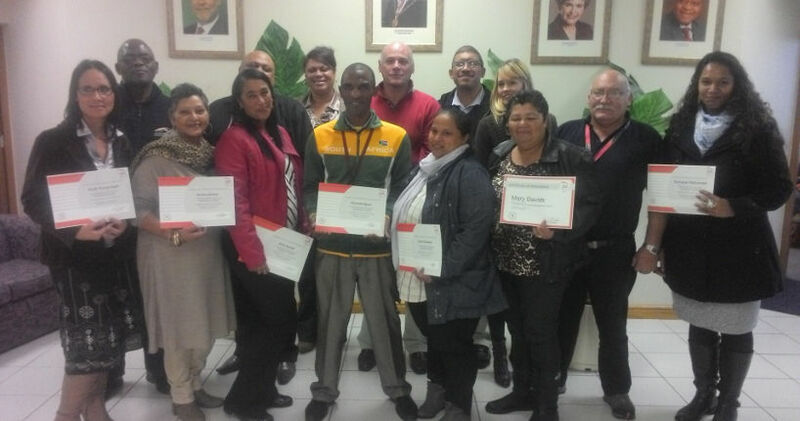 City of Cape Town facility managers receiving their Fundamentals to Energy Management Training (FEMT) certificates carrying 3 CPD credits for successfully completing the training and practical demonstration of what they learnt. The training was focused on training mainly non-technical staff like facility managers, building operators and maintenance staff. Izelle Bosman, Training Manager of the Energy Training Foundation, who facilitated the City of Cape Town FEMT project says, “The level of staff member is not important, whether it is a cleaner, a receptionist, maintenance personnel, or the managing director and CEO of the organization – every person in a facility’s actions influence the energy use.” Bosman refers to studies done on the largest impact on reducing carbon emissions which was proven that about 35% (AEE©) can be attributed to energy efficiency and within energy efficiency 30% of its success lies with human intervention or as we call it energy efficiency awareness. Bosman continues, “Pitching training to the right level of relevance to each person in the organization creates a realization of how and why their actions influence the energy use leaving a lasting impression on the employee, with the ultimate result of a long-term change in the human intervention aspect of energy use – this in-turn ensures sustainable energy savings.” This has proven an optimal approach to sustaining an energy management system and energy efficiency interventions. With the FMs not only being trained in the savings opportunities and where and how to find them, but the practical aspects that followed the theoretical training ensured that they understood the concepts and could physically see the difference it made to their division’s energy use. The FEMT training included topics such as energy costs over time, energy quantities, energy has quality (usefulness), energy for sensible heat, energy for latent heat, using the psychometric chart to determine set points of equipment, energy accounts and tariff structures, insulation, fenestration, heat flow and losses, HVAC, load factors, maximum demand, power factor, types of lights, lumens, lux, efficacy, light quality, capacitors, etc to name but a few. Using the training guide of their own meter reading equipment the trainer explained how to obtain information and how to identify possible energy management opportunities from the load profiles. With the City of Cape Town employees not only being trained in the savings opportunities and where and how to find them, but the practical aspects that followed the theoretical training ensured that they understood the concepts and could physically see the difference it made to their division’s energy use. The participants were required to present their proposed energy efficiency interventions with the best presentation being supported to implement their proposal. Another key success to the programme was allowing the participants to work in groups. Nine groups were formed, the task given comprised of a general set of theory questions based on the smart meter reading with the final question focusing on proposed energy efficient solutions. City of Cape Town employee Lucinda Jaffers presented a unique solution where she exhibited the ideal outcomes of the training by internalising the principles taught to her and went back to further educate her collogues and implementing the energy efficiency principles she was taught. Jaffers will be further supported by the Environmental Resource Management Department of the City to implement energy efficiency programmes. The overall qualities of presentations were of a high level clearly illustrating the success of the training. At the FEMT certificate handover to all the trainees, Martin Stander, Manager of Facilities Management at City of Cape Town said, “By up-skilling our staff to be able to become energy efficient in their work approach, we are growing our own trees, by growing our staff in this way.” Stander is very supportive of the training and the outcomes it delivered and congratulated his team on their efforts. All the trainees commented that the training was an ‘eye-opener’ as just a simple change was shown to deliver big benefits, but one has to know about and understand it in order to implement it – that is what FEMT delivered to them. The City has to date trained 45 of its building facility managers with the clear vision of ensuring sustainable management of their facilities.